What Size Battery Charger Should i Install? Battery charger size is based on the overall battery capacity that you have as well as allowing for what loads you would normally run when the battery charger is operating. The key to any battery charger is the basic operation. When a charging source is operating, it will supply all of the DC loads first and then what is left over will charge the batteries. For example, if you have a load running in the caravan at 10amps, say fridge and a few LED lights and you have a 20amp battery charger installed, 10amps from the charger will supply the load first and the remaining 10amps will charge the battery. 30+ years ago when battery chargers where a single stage static voltage charger, they would charge the battery and switch off. Based on this type of charger, the charger to battery ratio was 10%. With 3 stage temperature compensated “smart chargers” these days, the basic ratio of charger to battery size is now on average 15-25% of the battery capacity. So, let’s take the happy medium 20Amps. So, for a 100Ah battery, you would select a 20A charger. Charger to battery ratio for Lithium & Lead Crystal batteries is based on 30% for maximum performance and lifespan, i.e. 200Ah = 60Amp Charger. A lot of chargers have the ability to dial down the current output of the charger like the Enerdrive ePOWER range. Both the AC & DC2DC chargers in this range have adjustable current outputs. This allows for installing a bigger charger at the start if you think you may increase your battery capacity at a later date. This way you don’t need to buy another charger and waste money. 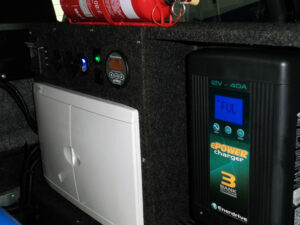 Now, most RV’s have multiple charging sources, mains/solar/vehicle charging. If you have the ability to run multiple charge sources at that same time, then these should not exceed 35% of the battery capacity combined for Lead Acid/AGM, 30% for Lead Crystal and 60% for Lithium. 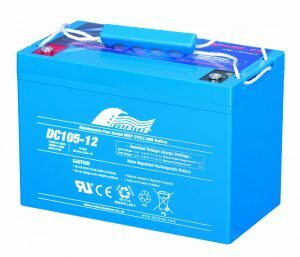 Ultimately, you should contact your battery manufacture and discuss the best charge current required for your specific battery bank for the best overall performance and lifespan.